The opening sequience isn't exceptionsally long, but it can't be entirely bypassed either. Putting the multiplayer in "Grudge Match" would be OK except that there's no mention that it's the location of the multiplayer (the multiplayer icon - already established and on the package) is not next to the option like it is in most games. Download time is under a minute (per game). The options are a little small (as are the labels), but they're still tappable. The buffer space is more than sufficient. The basic movement is handled by the direction pad, which is the easiest possible setup. The slowness of the beam/whip that attacks (opponents or targets) or picks up items will be extremely frustrating to players, especially ones unfamiliar with the game. The graphics are alright. The music is fine, but it isn't necessary for successful gameplay. The sound effects will start to get a little grating if you play several times in a row. Neither of the mini games have and selectable options. No difficulty level settings, no choice of time limit, only one racing location, etc. Konami is a terrific company that makes high quality games like the Castlevania series and the Dance Dance Revolution games that are celebrated and loved by gamers worldwide. But then there's Konami's licensed tie-ins, which lets games like this fall through the cracks. The game has some odd control decisions (no programming flaws - it was made to be like this) and a lack of functionality in it's multiplayer offering. Eveything about the game feels only partially cared about. On the game's official website, there are broken links. Even the back of the package says "Artha Penn is chosen to be the Dragon Booster, the only person who can bring peace to world." The game isn't entirely without merit, and can be played several times in a row before boredom sets in. Unfortunately, a couple sessions of this and you've had your fill for good. I've played (and reviewed) worse games, but most are far better. While it's been a long time since the game was released (and Konami's Dragon Booster license hasn't been made use of except for this once), a game about dragon racing (anime tie-in or not) could sell. I just hope the next effort (IF there ever is one) is better than this. Insert the multiplayer symbol next to the multiplayer option. Rename the multiplayer option "Multiplayer" (or something similar). Speed up the main beam/whip that attacks/collects. Add in difficulty level settings (frequency/speed of targets, number/type of items, etc.) to both games. Include additional options like choice of time limit and racing location. Fix the typo on the package (and prevent others). 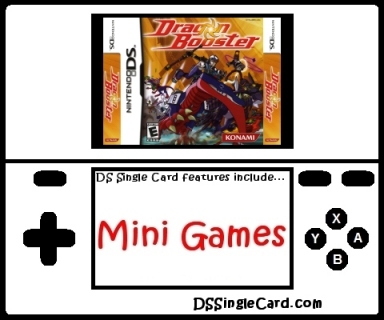 Click here to return to the DSSingleCard.com Dragon Booster profile.